1. James: picked up a grade one muscle tear to his soleus against Eibar on October, 2nd and will remain in Madrid for treatment this weekend. He's expected to come back against Legia on October, 18th though. 2. Modric: underwent arthroscopic surgery on his left knee for an extraction of a patellar chondral fragment of post-traumatic origin. Estimated time out: one month. 3. Ramos: suffered a tear in his knee ligament against Albania. Estimated return date: late November/Early December. 4. Coentrao: He's expected to return against Legia. 5. Case: he's unlikely to return for a number of weeks due to a leg fracture. 1. Marcelo: has completely recovered from the muscle strain he picked up against Villarreal and has been included in the 19-man squad facing Betis. Goalkeepers: Keylor Navas, Casilla and Rubén Yáñez. Defenders: Carvajal, Pepe, Varane, Nacho, Marcelo and Danilo. Midfielders: Kroos, Kovacic, Asensio and Isco. Forwards: Cristiano Ronaldo, Benzema, Bale, Lucas Vázquez, Mariano and Morata. Keylor Navas; Carvajal, Pepe, Varane, Marcelo; Kova, Kroos, Isco; Bale, Benzema, Ronaldo. 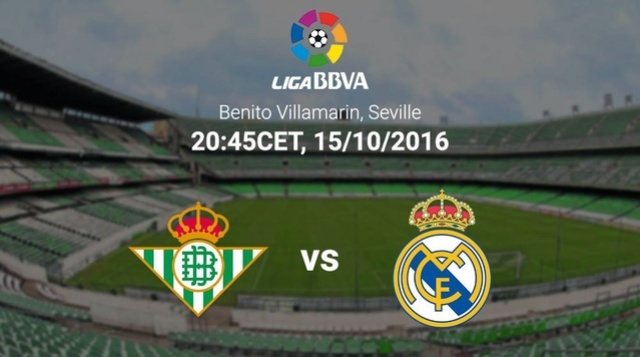 After yet another depressing international week for me, I'm hoping Madrid refreshes my footballing viewing this weekend. 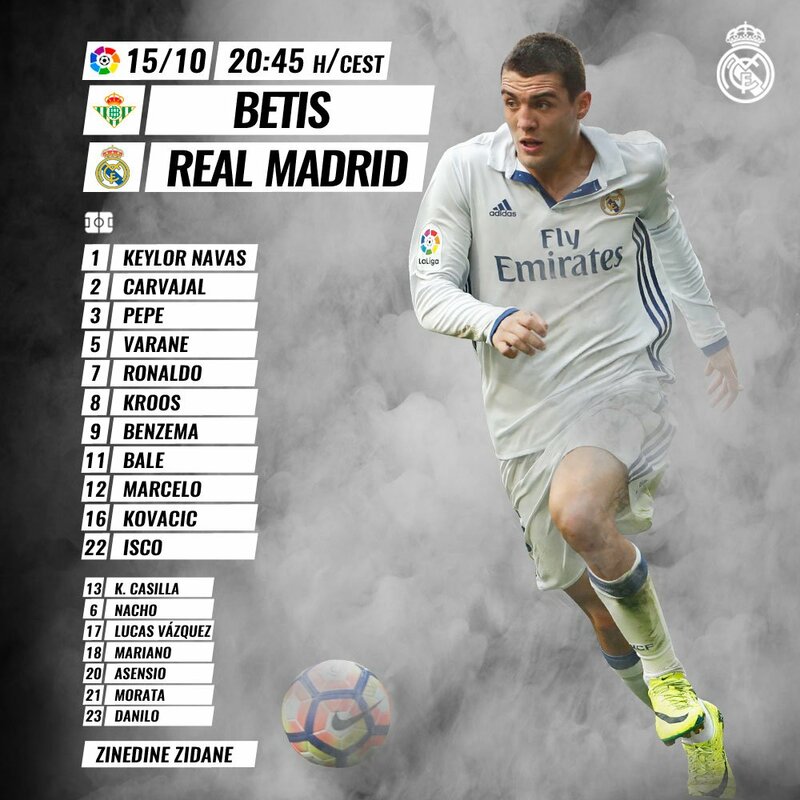 Navas; Carvajal, Varane, Pepe, Marcelo; Kroos, Kovacic, Isco; Bale, Ronaldo, Benzema. I forgot the last time we played like this. Finally, we're not retreating after going 0-1 up. Great first half, and we actually scored from open play. Benzema doing the two things I know Benzema is capable of i.e good finishing and lethargic movement, Kovacic looking good, Ronaldo looking good, Marcelo having a stormer, even Pepe has an assist to his name. I think we can call this a good match for us. The intensity has dropped. Z needs to inject fresh legs now. Terrific goal from Ronaldo, and a delicious combination between him and Morata. Now if Bale and Morata could get one each, this would be a perfect night. Cr missed couple sitters today about 3, hope he gets benched next game... .
Yeah, good away performance. And I get to see one of my favourite wingers in Joaquin make a mockery of our "midfield". Sigh, we need Casemiro back. Kova is such a boss btw. He was piercing through Betis like a knife through butter. 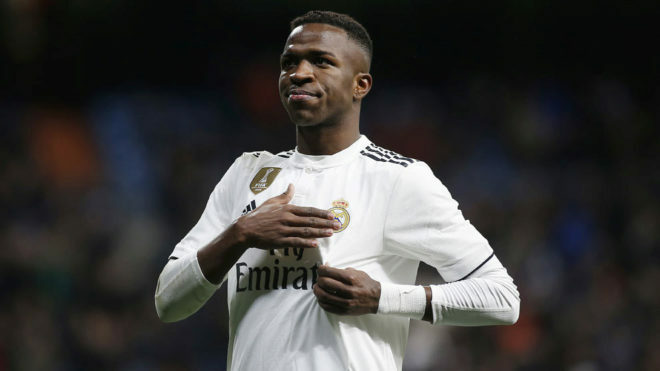 If we could develop him the right way, he really has the potential to become a world beater. Well that was a storming performance. Pepe is such a beast i love him. Oh and this Isco is brilliant to watch, hope it's not a one-off. Now lets get a winning streak going and cut out these poorly defended goals. Varane was in no mans land for the goal and went up to intercept instead of staying back.